Climate change and public health are integrally related, and while some folks have been trying very hard to push public health front line staff to take more aggressive stances on climate change policies, without warm embracement. Embracing environmental health issues that have outcomes measurable over decades is challenging without current political time frames. Incorporating specific targets on issues like greenhouse gases is more tangible and concrete, hence have been more readily accepted without question of the rationale or purpose in achieving such guidelines. The more global issues of climate change are worth a discussion. Today’s trigger came as a retweet originated from Dónall Geoghegan @DonallGeoghegan as a photo of the proportional allocation of greenhouse gases by country. The innovative design was worth replicating, and the origins other than the Tweet are not ascribed. 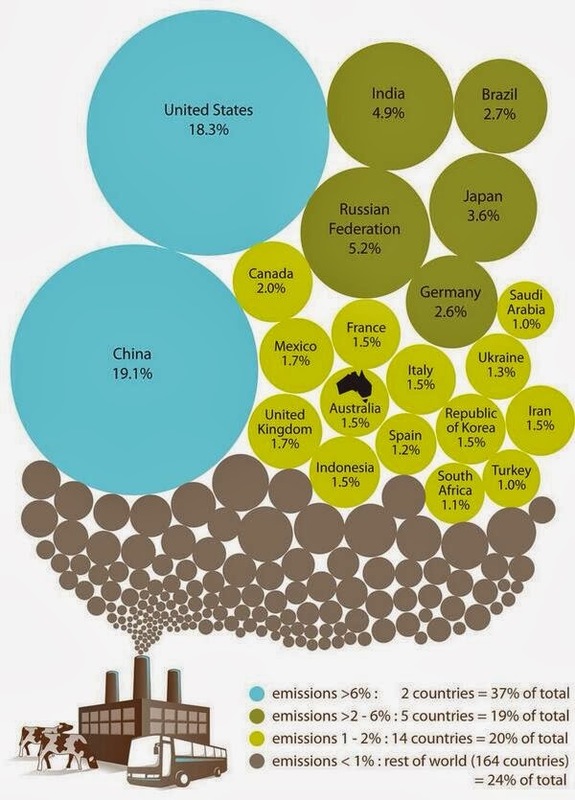 While the graphic looks at arbitrary political boundaries that we are familiar with, adjusted by population the list of top producers changes per capita emissions by country and is dominated by oil and gas producing countries, with Canada sliding into 12 place, two spots ahead of the US. China ranks 121st, India at 162nd both of whom appear implicated by the absolute volume production. Diving deeper Canadian greenhouse gas (GHG) production is documented at National greenhouse gas inventory An amazingly succinct and clear document to read and follow. Whether filtered by political manipulation, the purpose of the document is for reporting to the international convention and seems to address current needs in a moderately objective manner. Of note, that Canada’s major GHG production is broken out in the graphs on both pages 4 and 5. Energy and transportation dominate the sources. Alberta producing just over 35% of the GHG. On a per capita basis, the Maritime provinces, Quebec and Manitoba are the lowest consumers. Again, the simple adage of oil and gas producing provinces having the highest per capita production of GHGs. Oil sands production contributes to about 8% of Canadian GH emissions. While recognizing the source, it is often useful to review industry developed interpretations and this can be found at Oil sands today GHG and Canadian Association of Petroleum Producers, both of whom emphasize the relative contribution to coal production and the proportionate contribution by the consumer compared with their role in production. Fair points to consider. The good news is found in the national inventory document. Irrespective of the measure, Canadian GHG have leveled off and are slightly declining. Will it be sufficient to meet the 2020 Copenhagen Convention target of a 17% reduction? It wasn’t sufficient to meet the Kyoto targets that Canada quietly abandoned. created by Kirsten Duncan for the then Australian Government Department of Climate Change and Energy Efficiency.